Normally I take a break from writing about War machines for Thursday, but I am halfway through a story, and definitely don’t want to get over a week out before I try and remember two more games. 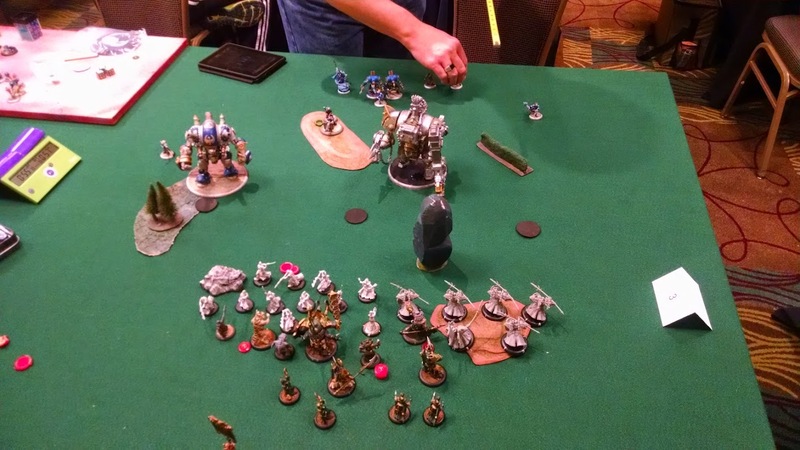 I was 1-1, and got paired up against a newish player toting along Cygnar. He knew the rules well for someone who’d not been playing long. On his tray was Haley 2 with Stormwall and Gastonne-Galleon and Sturgis with Stormwall and a Stormstrider. I felt the pinch of DNC 1, and decided to toss out Mordikaar simply to make sure that I had the opportunity to pick in my last round. I also wanted to have the raider with snipe out there just to make sure and keep Haley2 honest if he dropped her, with the side benefit of being able to take down Gastonne if he got to close. He picked Haley 2, like you do. We played Incursion, and I can see why having all the flags stay is not a fan favorite. Turn one I ran up and tried to position myself for a solid scenario presence, and turn 1 he ran in as well. Stormwall hugged the far flag, and galleon started to wedge himself between the two other flags. I made a rather large mistake not giving the Agonizer any fury on turn one, and it caused a cascading effect in the next few turns as I had to get dangerously close in order to affect any of the enemy models. 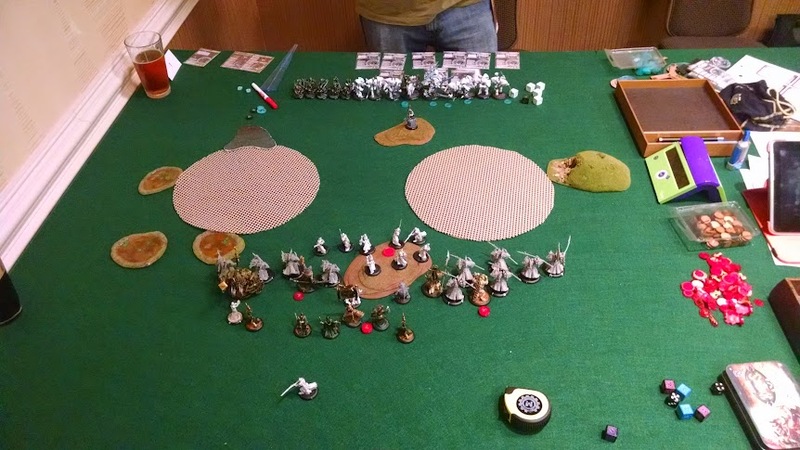 This game, with so few models to eliminate my Nihlitors, I was pretty aggressive with my positioning, trying to get deep in his guts under my feat turn. It also helps that I went first, the first time in a while. As you may notice, I also sided out the Incindiarii for a Krea and Orin. While it would have been nice to have Haley Burn, I figured it wasn’t worth leaving the Krea at home. The rest of the game played out about Where the two colossals are hanging out. Thinking back on it, I probably should have just dropped fist and blown up both colossals on feat turn, but that is hindsight talking.I wasn’t able to really damage the Galleon with the Cetratii, I wasn’t able to really do work against the stormwall with the Nihlators, but I was, finally, able to neutralize them both. The Shaman managed to pick off Gastonne, like I had hoped, and the Raider took out Meg, making sure that the Galleon would sit and rot. Tiberion, unafraid of the Drag on Galleon prior to his nullification, so he just sauntered over to the engaged and swamped Stormwall and laid into him. It took me two rounds, but I was able to scrap him. This was one of those games with Mordikaar were I just sat on 10-12 focus every round and pumped out more and more dudes. I basked in the glory that was revive and slowly was able to grind out the opponents army. At the end of the day, Haley was in a catch 22 situation, circled by Nihlators with more to be resurected to the north, and penned in by Tiberion to the south, she had to give one of the back arc, and she chose Tiberion. Two hits took her off the map, and Mordikaar took away his first victory in a while. These 6′ tables were driving me nuts, and it did it again here. As you can see in the picture, I deployed way to heavily to one side, and that was after I ran everything diagonally across the board towards the wall. You can also see that there are two delicious brews to the left of the table, as neither of us were in contention at this point. I stuck a Nihlator way in the back by accident, and managed to gum myself up in deployment a number of ways, including having the Krea on the wrong side of the board, along with Tiberion. One thing I learned here is that you want your strong pieces, when going first, to be in the center of your deployment. That will enable them to react to either side of the board that needs them. Having them on one side or the other will prevent them from getting to the zone or area fast enough to make an impact. The feat worked well enough, though I was unable to capitalize afterward due to the placement of his models, and my Nihlitors kept toughing at all the wrong times, giving him free synergy ticks. The Krea, in order to avoid getting smashed to death by Imperatus, had to run wide out of the game and making my life miserable, while the Incindiarii were peppered to death by the Nyss. Tiberion made it across the board to drop Imperatus, with a little help from some Cetratii, in a single round, and made his home in the zone, mean mugging Vyros, who had been dominating the zone and making my life miserable. The final play of the game came when I was able to revive and resurrect two Cetratii and send them into Vyros 2, along with one I was able to free up with Tiberion. I needed 8’s, but that’s not terrible. Two whiffed and one connected, and at -8 did an expected 2 damage. Then, on his turn, he cleared the zone opposite of Vyros, killed one of the Cetratii, and zoomed over to the new zone. Now, needing 6’s, the Cetratii connected, and with four dice, decided to spike high, and he took 13 damage from the two freestrikes. Sadly, it wasn’t enough for Vyros to drop, but it was enough to make Mike Sweat for a few minutes. It was this game that I realized a few things, especially after talking to Mike. I mentioned them in part 1, but I really think I have to be more aggressive commiting to zones. It could be unfamiliarity with the army because I’ve just picked up Skorne after years of neglect, but it is also the lack of knowledge of my own caster, and the armies outside of the meta. But there is also another contributing factor, and thats knowing the people. I know how almost everyone in our area plays, I know what type of bait they take, I know where their armies are going to be, and I, mostly, know what their goal is with their army. Here, I knew nothing. It was both frustating, and a joy, because learning the game rather than learning how others play the game, is very enjoyable. All things considering, I feel I did very well. I went in with a simple goal, that of going 2-2, and I hit it on the head. I only lost to the eventual tournament winner, and Mike Ireland. Now, I am looking ahead to the ECR, but this time I will be running the events there instead of partaking. Judging and running is a different kind of fun, and I get to sample more brews and meet more people this way.